After a long, exhausting night of travel, Katie and I were pretty wiped out by the time we got to our hotel in Kuala Lumpur. We spent some time recouping then went for a walking tour around our neighborhood with the intention of going to the top of the Petronas towers. 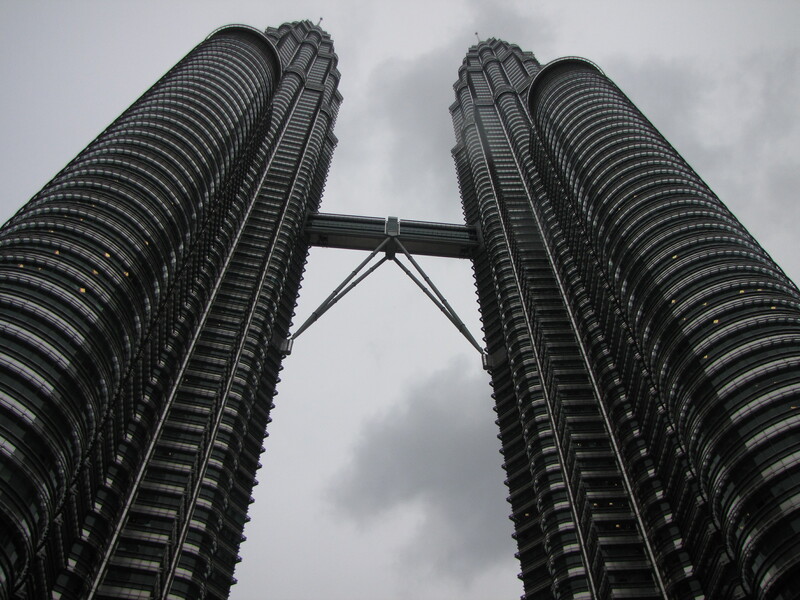 The Petronas Towers are twin skyscrapers and were the tallest buildings in the world from 1998-2004. They are not only famous for their height but is a glamorous 21st century icon for Kuala Lumpur. When we arrived at the Petronas tower we learned that they were completely sold out of tickets for the rest of our time in the city. Low on steam, we decided to just go to the aquarium that was in the shopping center attached to the towers. The aquarium was pretty much like all others except that in addition to fish, it housed many land animals and had a cage for shark diving; clearly ideas began running through my head. Not to worry, I was not up for getting my hair wet so I decided against the dive. 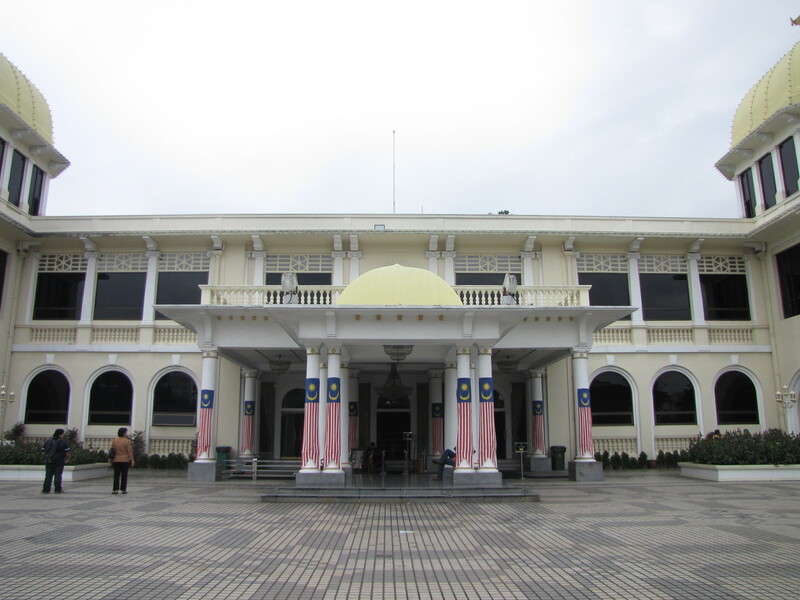 Our final city tour was to the National Palace, Istana Negara which was the residence of the king of Malaysia from 1957-2011. In 2011 a new palace was created for the King and this was turned into the Royal Museum. 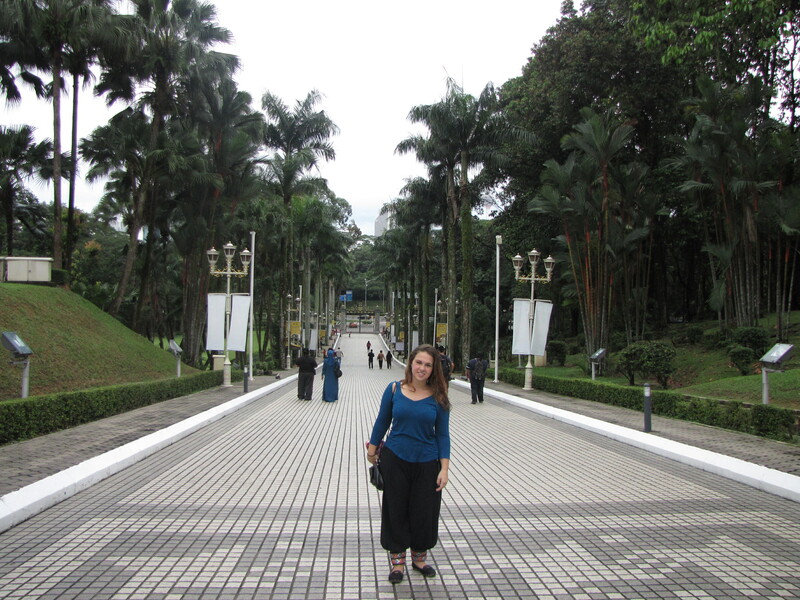 We spent our final two days in Malaysia outside of Kuala Lumpur. 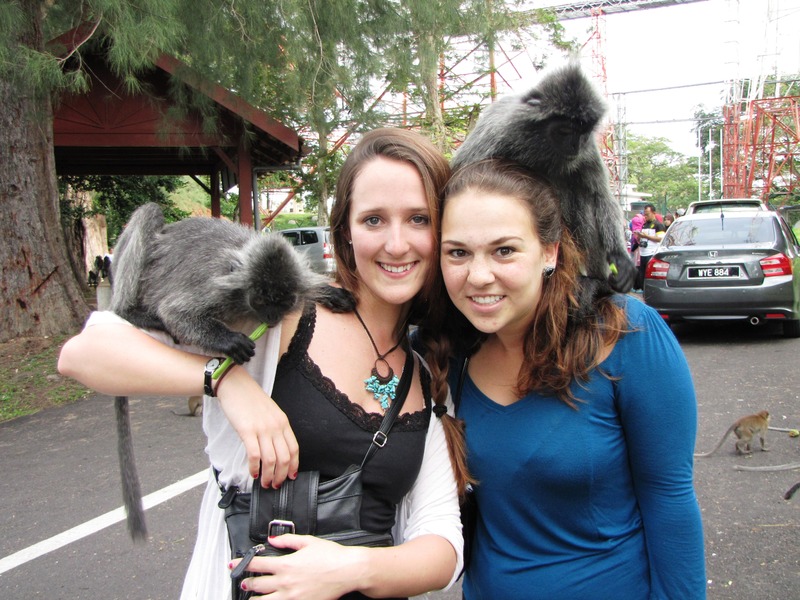 Our first day trip was with Han Tours to Monkey Island to feed and get close with very friendly Silverleaf monkeys. When we arrived we bought 10 bundles of string beans and were instructed to only take one out at a time. Even with only one string bean out, swarms of monkeys jumped towards us knowing that another bean would be pulled out of our purses soon. 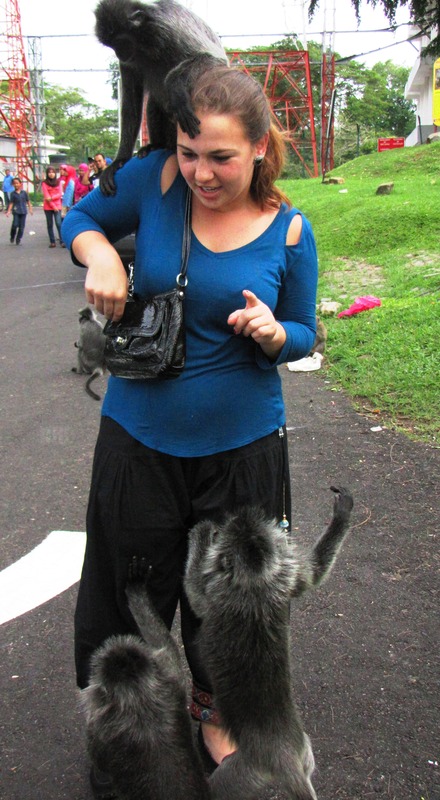 After feeding a lot of monkeys and having some jump on my head, I accidentally forgot to zipper my purse. 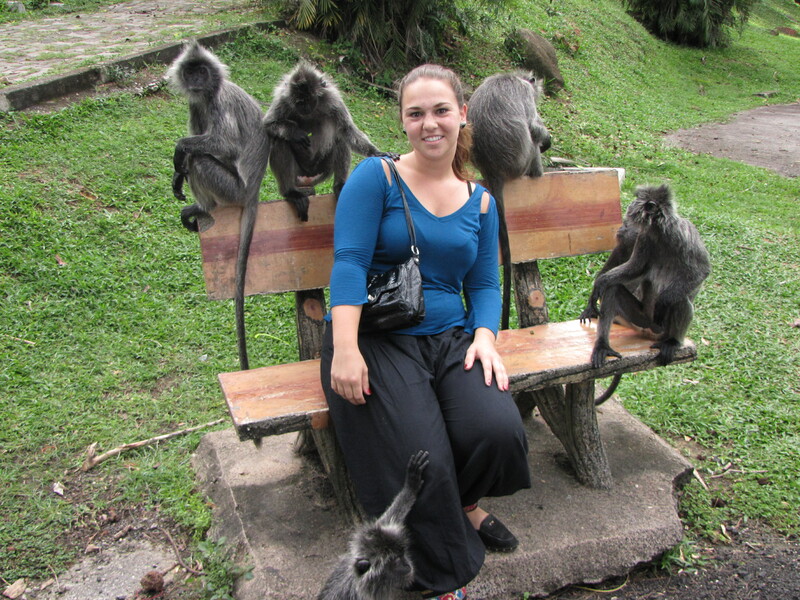 Over a dozen monkeys latched on to my legs, arms, pants, shirt and head and all reached into my bag to grab the beans. The string beans exploded out of my purse and filled the streets and then the monkeys lost all interest in me. When we were out of beans we made our way to the water for a Chinese seafood dinner and then the firefly tour would leave from the port. When it was starting to get dark we boarded the boat and we finally reached a swampy area where all of the trees were lit by the glowing bugs. It looked as if there were Christmas lights in the trees along each bank of the river. Foolishly, I did not think this through and forgot my bug spray so within minutes my feet had been attacked and I was extremely uncomfortable. To my benefit, a thunder and lightning storm came over us and the tour did not last too much longer. 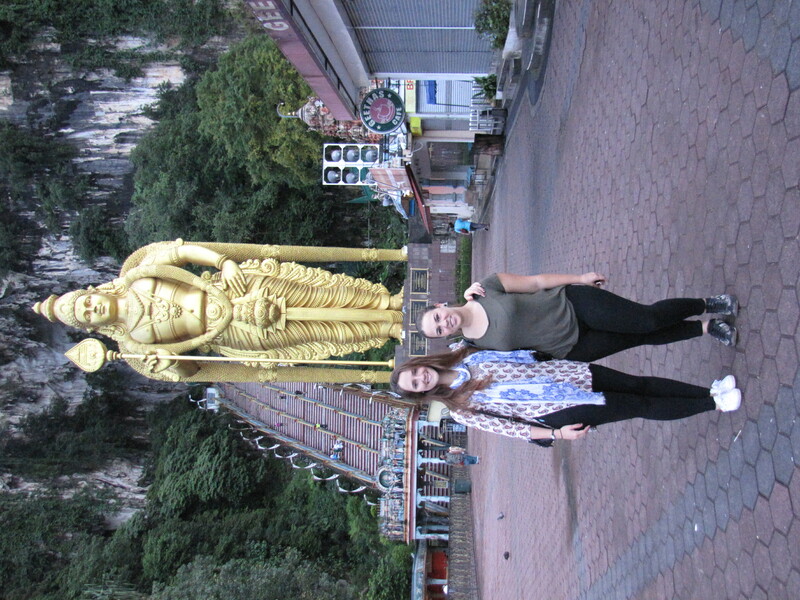 At the crack of dawn on our final morning in Kuala Lumpur we visited the Batu Caves. It had felt like a long time since we woke up that early and by 6:45am we were in a cab leaving the city. 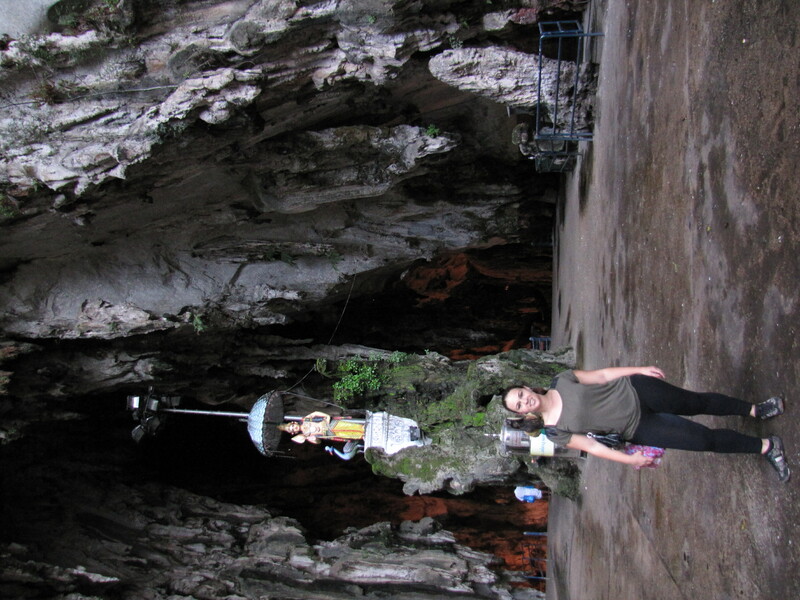 The Batu Caves is a limestone hill that has many caves and is a popular worship site for many Hindus. 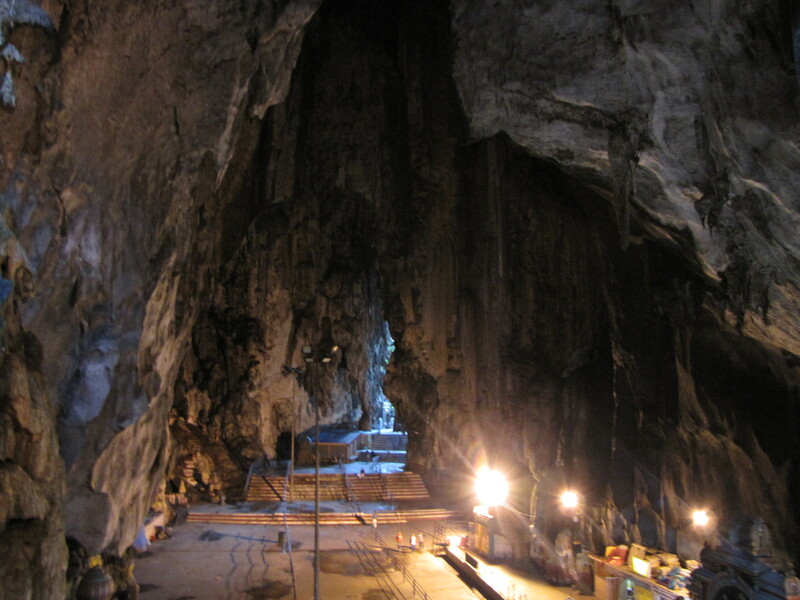 Outside of the cave there is one temple and inside there are two more. There are 272 concrete steps that lead up to the caves and the inside is filled with rosters crowing and worship music playing.